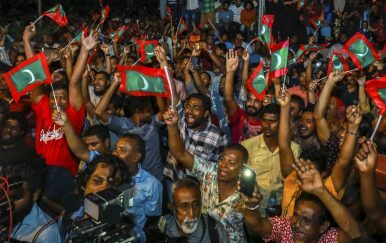 Maldivian opposition protestors shout slogans demanding the release of political prisoners during a protest in Male, Maldives (Feb. 2, 2018). An Indian Ocean archipelago of 1,192 islands, the Maldives is a tourist paradise. It is a low-lying country that is expected to be among the first in the world to go under water as a result of climate change. While it may take a few more decades for rising sea levels to wreak havoc on the archipelago, there are more immediate and pressing problems tearing the country apart. The Maldives’ fledgling democracy is in tatters. What set off the current crisis was a Supreme Court ruling on February 1, overturning the convictions of Yameen’s rivals. In addition to ordering the government to release the nine convicted opposition leaders, the apex court called for reinstating 12 parliamentarians who were stripped of their seats last year when they left Yameen’s Progressive Party of Maldives to join the opposition. Not only has Yameen ignored the court order, but he went on to declare an emergency and had the judges who handed out the ruling arrested. The reason underlying Yameen’s controversial decisions is obvious: he is determined to cling to power. Reinstating the 12 parliamentarians would reduce his government to a minority. That would enable parliament to oust him in a no-confidence vote. The Indian government has said it is “disturbed” by the declaration of emergency in the Maldives and “the suspension of [the Maldivian people’s] constitutional rights.” It is “carefully monitoring the situation,” it said. Earlier, its Ministry of External Affairs issued a travel advisory to its citizens traveling to Maldives. However, bilateral ties have been fraying since Nasheed’s exit from power in 2012. That year, the Maldivian government abruptly terminated a $500 million contract awarded to India’s GMR Infrastructure for developing an airport in Male. Bilateral ties have deteriorated since then. Yameen’s authoritarian governance has irked India, but it is his tight embrace of China that has raised hackles in Delhi. The time “may indeed be ripe for a decisive Indian intervention in the Maldives,” C Raja Mohan, noted strategic analyst and director, Carnegie India, Delhi, observes in an op-ed piece in Indian Express. Such intervention by India would have the support of countries like the United States and United Kingdom, which would be keen to see the pro-China Yameen removed from power. If India does decide in favor of military intervention, this will not be the first time it has done so in the Maldives. In 1988, India sent in a small contingent of troops to avert a coup attempt against Gayoom. But the circumstances of that intervention were different from what exists today. In 1988, President Gayoom invited India to intervene. Yameen is unlikely to do so now. Importantly as well, 30 years ago the coup plotters were just a small group of mercenaries. A military intervention today could leave Indian troops stuck in a Maldivian quagmire. It could also prove counterproductive to India’s long-term interests. It would push Yameen closer to the Chinese, for instance. Besides, it would boost perception of India as a “big brother” and a “bully” in the region. Undemocratic forces in India’s neighboring countries have usually stoked anti-India sentiment among the masses by stressing such perceptions. This can be expected to happen in the Maldives too. Importantly, an Indian military intervention is unlikely to benefit democratic forces in the Maldives in the long run as a democratic government, should one come to power in the archipelago following an intervention, would be seen as “made in India” with the United States acting as a “midwife.” Such a government would lack legitimacy in the eyes of many Maldivian people. India is said to be working with a group of countries, including the United States and Saudi Arabia, to pressure the government through imposition of sanctions. However, India has traditionally opposed the sanctions option to influence regime behavior, as sanctions affects ordinary people rather than the ruling elite. As a first step, India could offer the Maldives its good offices, perhaps act as a facilitator or even a mediator in a possible dialogue between the Maldivian government and the opposition. But will Yameen welcome an Indian role? Besides, does India have the leverage to influence his decisions? He has reportedly defied Indian requests relating to the current crisis. Unlike India, China has leverage with the Maldivian government. Yameen is likely to listen to China. But Beijing would not want to see him go. China is opposed to India meddling in Maldives and has made this more than clear. An editorial in China’s state-run Global Times chided India for openly intervening in its neighbors’ domestic affairs. There is “no justification” for India “to intervene in Male’s affairs,” it observed.